I would like to nominate Bobby Brown, Manager of the 50+ National Division Giants for Manager of the Month. Bobby is one of our most respected players in the Sacramento league. His team reflects his sportsmanship and reliability. The waivers are done and fees are paid timely. He also plays in the Sunday league on the 40+Free Agents and assists the manager when needed. Due to so many Sacramento rainouts our schedule has been very condensed. There have been games where the other team is short players and when I reached out to Bobby to ask if he would work with the opposing manager on allowing replacement players, he didn’t hesitate. He allowed them to play wherever needed and not just right field or first base, as is our normal league rule. He has been very helpful as forfeits have been prevented. Bobby continually goes above and beyond with communicating with the league Commissioners and myself regarding games and preventing forfeits. He is also one of the best 50+ players in the country and has many championships both here and from the MSBL World Series in Arizona. 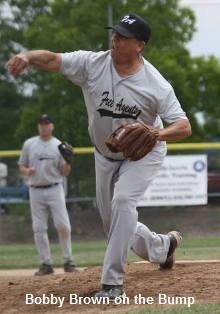 Last year he was a key player on the 55+ Sacramento Royals. I would like to congratulate Bobby and thank him for making Sacramento MSBL proud.